We have two goals for this video: provide an update on our 1959 17’ Chris-Craft Deluxe Sportsman preservation project, as well as an, albeit compressed, clinic on topside Dutchman repairs. As is clear in the clip, the bottom painting milestone has evaporated far into our wake. Applying five coats of Interlux 2000E Epoxy Primer – barrier coat – was followed by applying three coats of Pettit hard Racing Bronze Enamel. Why three coats when Pettit recommends only two? We always sand the first coat thoroughly, even to the point that the 2000E “ghosts” through over much of the bottom. Yes, doing so costs time and, on this boat, an extra quart of bottom paint, but sanding also improves adhesion and results in a flatter surface. The entire subject of the pros v. cons of employing Dutchman repairs to preserve the maximum-possible amount of original planking is much like asking five economists to predict next year’s inflation rate. You get at least seven conflicting forecasts and explanations for same from the economist, and at least as many from those taking various positions on the Dutchman. Simply put, since we are preservationists first and foremost, we have and will continue reaching for one of John’s magically-disappearing Dutchmen whenever doing so saves a plank. 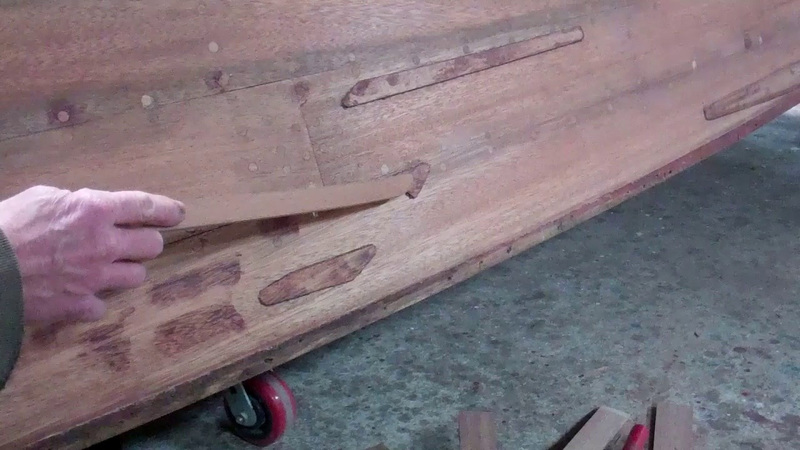 As is clear from this clip, John is saving many planks on both port and starboard for this classic 1959 Chris-Craft’s topsides.